Recently, Microsoft finally decided to hit back at Apple for the “I’m a Mac, I’m a PC” ads. The Mac ads have been around for several years now, so it’s surprising that Gates and Friends decided to wait this long to respond. Apparently, Bill Gates hates the ads. Of course, if I were the creator of Microsoft, I would probably hate the ads too, all the more because the ad campaign’s long-lived and continually has new ideas. At any rate, Microsoft has decided to retaliate with their own “I’m a PC” ad. It begins with someone resembling John Hodgman saying, “Hello, I’m a PC, and I’ve been made into a stereotype.” It also features people talking about their glasses, rings, and a bunch of other people claiming to be PCs. It has several celebrities, noted authors, and artists. The ad seems to be a direct rebuttal to the Mac ads, that PC users are extremely diverse and varied in their experiences and professions. It starts out with the familiar “I’m a PC” declaration, but then shifts into identifying characteristics. People wear glasses (Bill Gates and a server admin), wear jeans, study genes, design jeans, design green buildings, etc. Tony Parker has three rings. Eva Longoria Parker only has one. Intermittently placed throughout these declarations is someone who says “I’m a PC” again. About midway through and throughout the rest of the commercial, each person states that they are, in fact, a PC. On its face, the ad works well. The ads certainly are more effective than some of the recent Microsoft ads. In one, you have Jerry Seinfeld running into Bill Gates, who is discount shoe shopping. Seinfeld talks his signature stuff in the ad – nothing. The ad ends with Seinfeld asking Gates if computers will ever be “moist and chewy, like cakes.” Huh? In another, Microsoft itself implies that its own users are gullible. The ad shows users the new, upcoming Windows “Mojave” OS. The users are unsurprisingly wow’ed by the operating system. Then it’s revealed that the operating system that they’re using is actually Windows Vista, not an unreleased version. I’ve personally used some of the features that are mentioned in the ad, and they annoy the fire out of me. The “Security” feature? You mean the one that pops up and asks you if you want to allow virtually everything that you do on the web? Please. The latest ad, though, is much more effective at showing “PC” users as a broad group that have varying interests and purposes for their PCs. It’s true that PCs are in much wider use than Macs. The availability of software for Macs just doesn’t compare to that of PCs. As a recent convert from PC to Mac, I’ve missed the availability of games for PCs. But, beyond all of that, there’s a problem with the commercial, at least in my mind. It completely misses the point. 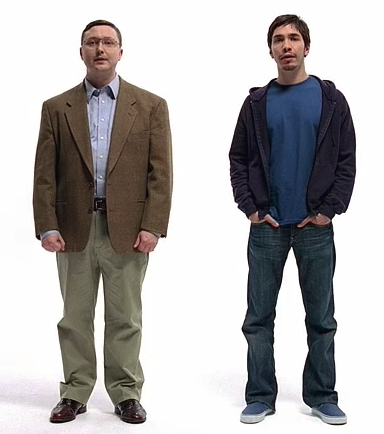 The point of the Get A Mac ads isn’t to point out the singularity of PC users themselves. The ads take aim directly at Microsoft Windows itself (though they have occasionally taken shots at the total package, the target remains Microsoft). The ads don’t mean that every PC user wears glasses, wears tweed suits, and only uses the computer for spreadsheets and pie charts. Hodgman’s character represents the computer itself, and the problems that the Windows operating system has. The ads were never meant to belittle PC users themselves – why would they? That’s their target market. While the Get a Mac ads are hyperbole to an extent, they’re pretty accurate in how easy it really is to use the Mac OS vs. Windows. The bottom line? That spiffy new Microsoft ad was made on a Mac. Nice work, fellas. Frankly I’m a little upset that the Macs in those ads are portrayed as a smug douchebag. Apple stores use Windows Mobile to process credit cards. Ironies are everywhere! Ah, but like you said recently, you’re the exception to the norm, Chris. My dislike of Windows comes from experience with the product, not from Mac ads. I kid you not, when I worked with Vista at my last job before coming to school, it was dang near inoperable. It was a resource hog, security popups were consistent, and it crashed. A lot. On the other hand, when I switched to my Mac and upgraded the OS to Leopard when it was released, I had none of these problems. The gullibility doesn’t come from the fact that Windows users get their information about Vista from Mac ads, it comes from the fact that Microsoft THINKS that’s where they get their information about Vista. As for being the exception and not the norm, that is debatable. People complain when things are bad, people are less inclined to praise when things are good. I admittedly do know some people have had a hell of a time, while another group has had smooth sailing. I wish there was some way to quantify the groups factually!